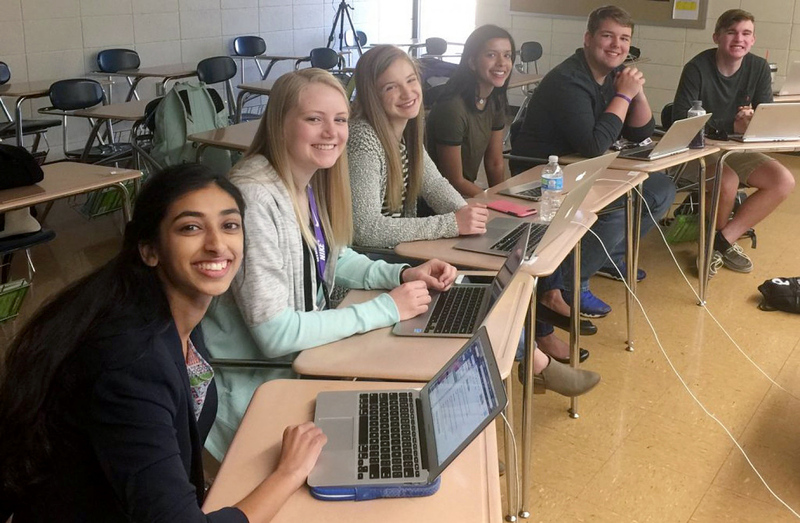 Students Gina Mathew (from left), Kali Poenitske, Maddie Baden, Trina Paul, Connor Balthazor and Patrick Sullivan at Pittsburg High School in Pittsburg, Kan. When reporters for the student newspaper there dug into the credentials offered by their new principal, they found issues that led to her resignation. In Kansas, a student newspaper is being praised for its hard work in reporting that Pittsburg High School's newly hired principal had seemingly overstated her credentials. The principal, Amy Robertson, has now resigned, after the paper found she claimed advanced degrees from Corllins University, an entity whose legitimacy has been questioned. "In light of the issues that arose, Dr. Robertson felt it was in the best interest of the district to resign her position," the school board said Tuesday, adding that it will now begin looking for a new principal. The turnabout came just weeks after Robertson was hired. Until Pittsburg High's newspaper, The Booster Redux, published its findings last Friday, the main impediments to Robertson starting full time on July 1 had been her impending move from Dubai and the need to acquire a Kansas school administrator's license. "She was going to be the head of our school, and we wanted be assured that she was qualified and had the proper credentials," said editor Trina Paul, a senior at Pittsburg High, according to The Kansas City Star. "We stumbled on some things that most might not consider legitimate credentials." Praise for the newspaper's staff has been rolling in from beyond its hometown in southeast Kansas, as news of the students' careful and diligent work spread. "Loving all the support of the kids by professionals," their adviser, Emily Smith, said in a tweet. She noted that after Topeka Capitol-Journal reporter Justin Wingerter tweeted about the paper, he was retweeted by Todd Wallack, a member of The Boston Globe's Spotlight team. The high school newspaper was preparing a feature article about the new principal when reporters found the irregularities. They brought their concerns to the school district and were encouraged to contact Robertson directly — so that's what they did, in a conference call that included Smith and the head of the school board. "During the call, Robertson presented incomplete answers, conflicting dates and inconsistencies in her responses," the newspaper reports. "The extensive amount of research that we had done really didn't line up with what she said was true on her end," Gina Mathew, a junior at Pittsburg High, tells NPR's Kelly McEvers. Mathew was one of the six reporters who led the paper's investigation. As they did more research, Mathew tells Kelly on Wednesday's All Things Considered, she and other reporters realized that "those inconsistencies were what needed to be presented within our own newspaper, and to highlight to the community what we had found." Mathew says that while some in the community tried to dismiss the students' concerns, "We knew that there was a story to be heard here, and that's exactly what our paper sought out to do." By conducting interviews and collecting details from online databases, the newspaper's staff tracked down a complicated story with many moving parts, from an online university with seemingly no fixed U.S. address to Robertson's travels between Spain, New York and what she described as a Corllins campus in Stockton, Calif.
More fact-finding revealed doubts over Corllins' accreditation and whether the school had a business license in Stockton's San Joaquin County. As the staff of the Booster Redux worked through those details, doubts about Robertson's qualifications were also raised in the local newspaper, The Morning Sun, in the form of an anonymous letter to the editor signed by "Pittsburg Citizen X." The student newspaper published the results of its investigation last Friday; one day earlier, the Pittsburg Community Schools' Board of Education had released a statement titled "Dr. Robertson Brings Decades of Experience to PHS," which seemed to be a response to questions about its new hire. "Robertson comes to Pittsburg with decades of experience in education, which include international exposure as a teacher and administrator," the board said. The statement also noted that high school staff and students had agreed Robertson was the top candidate for the job — a sentiment that, as The Booster Redux reported on Friday, was echoed by history and social studies teacher Marjorie Griffin, who was on the board's search committee. "I thought she interviewed very well," Griffin told the paper. "I thought she had all the answers." But, Griffin told the Booster Redux, she became more uneasy as the issue of accreditation and other questions arose.